Simon has provided a working approach but it feels awkward in that you are converting factors to numbers visually, adjusting spacing, and then putting the labels back on. I believe that there is a fairly straight forward tidy approach to deal with this problem. 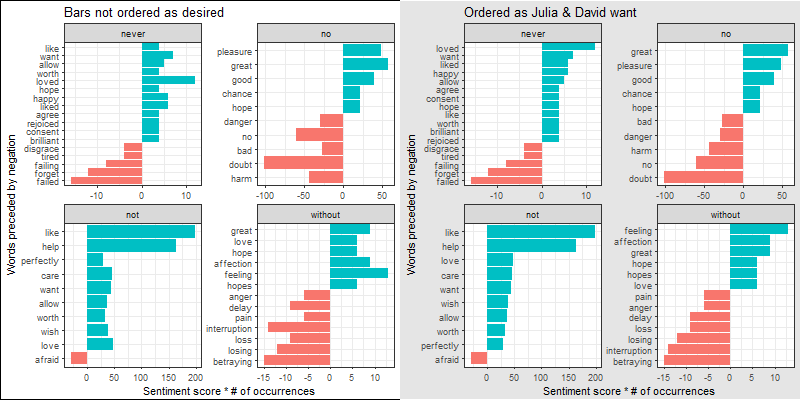 This entry was posted in ggplot2, r, text, tidytext, tidyverse, tylerrinker, visualization and tagged ggplot2, R, tidyr, tidytext, tidyverse, tylerrinker. Bookmark the permalink. Nice workaround for a common problem without an obvious solution. * fill = contribution>0 instead of recalculating it would streamline the code a bit further. * Also the initial `mutate(word2 = reorder(word2, contribution))` could be removed imho. Yes agreed for this specific code. The five lines were the main point… to show a generalizable approach. is the period used in the line of code below denoting the newly mutated “word2”? Please disregard my reply made January 12, 2017 at 2:09 pm. My confusion stems from reversing the factor levels. Your code works great, but I cannot make sense of the ordering. After working through the code a few times, my intuition still tells me that the mutated word2 variable, when converted to a factor, would have levels arranged in alphabetical order. The “rev(.) would then put “word2” levels in reverse alphabetical order. This post has been extremely helpful and I foresee myself using this trick on future problems. However, I would like to fully understand how its works before moving on. I appreciate any help you are willing to provide! Great publication, as always you do. 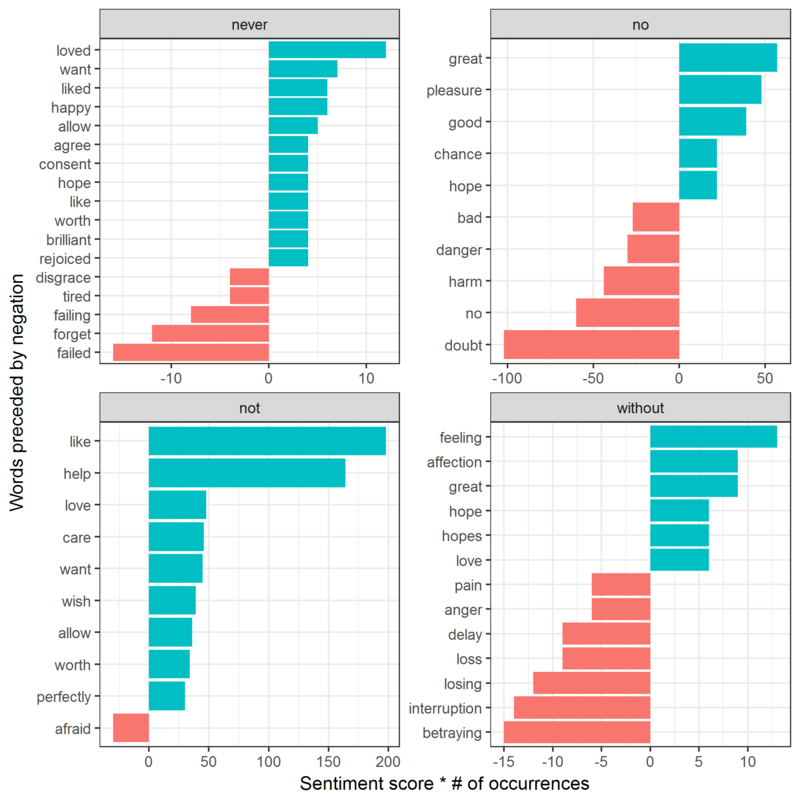 I am just working my knowledge on text mining and sentiment analysis. I got this publication and I am following the online book publication “Tidy Text Mining with R” [ http://tidytextmining.com/ ] too. So far it has been al ok but I need to get the data files “tweets_julia.csv” [Julia Silge] and “tweets_dave.csv” [David Robinson]. Any chance to get those files from you? I suggest you ask the authors. Both are receptive people who are active on twitter. Yes agreed for this specific code. The five lines were the main point… to show a generalizable approach. Other than those five lines I did not write the code. Referring to the “# create plot”, section, could you have changed “group_by(word1, word2)” to “group_by(word1)” or “group_by(word2)” or left it out completely and still obtained the correct order? I removed “group_by(word1, word2)” completely to experiment with the grouping function and got the same order. I am not sure if this was by luck or that the “negated_words” data frame was still group from the “group_by(word1)” line under mutate. Have a look at the other comments here as I think they answer the question. If not feel free to post a follow up comment.